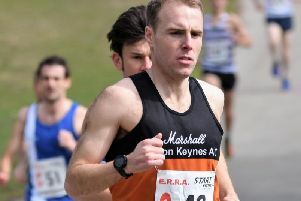 A record 111 runners completed day one of the 33rd Tour of Milton Keynes. Up front there was a dead-heat between Tom Comerford(MMKAC) and Tim Harris(Ampthill) clocking 37.00 for the three lap course around Tattenhoe Park. Mark Ryall(MMKAC) placed 3rd(37.58), Elliot Hind (Leighton Buzzard) 4th(38.04) with Gary Blaber(MMKAC) 6th(38.32) and first M40. Rachel Robinson(MMKAC) making her Tour debut was easily first lady(41.51). They faced another five races during the week; 5mile cross-country at Potterspury, a one mile track race at Stantonbury, a 5mile race around Campbell Park, a 2mile hill race in Brickhill Woods and finally a 6 miler from Woughton Playing Fields to and from and around Willen Lake. A quiet weekend for MMKAC. Lady hammer throwers Kayleigh Presswell and Laeken Impey managed to fit in two competitions in on the same day in Kent and Surrey. Firstly at Tonbridge with throws of 47.66m and 47.49m respectively and then later at Crawley Kayleigh improved to 52.22m with Laeken throwing 46.53m. On the track Chris Clarke ran 20.69 over 200m at Lee Valley, a week earlier having set a season’s best of 20.54 at Coventry. Liam Smith ran the fastest 10,000m track time for five year at Stretford, Manchester when winning the BMC “B” race. His time of 31.47.74 moves him to no 6 in the club all-time rankings. Ebony Carr and Jamil Hassan competed in the UK Schools Games at Manchester and saw Ebony win another bronze medal recording 12.49 in the Inter Girls 100m. On the roads, Geoff New placed 74th with a time of 95.08 in the Wolverhampton Half-Marathon where 640 finiushed.